There’s so much to cover here in Berlin, that I can’t possibly fit it all in to one blog post. I have to tell you about the excellent public transport system, the suffocating dominance of car parking, the superb driving conditions, the less-than-superb cycling conditions, the at times downright hostile footways, the culture and attitudes, the VC-and-helmet-loving local cycle campaign, and so much more. 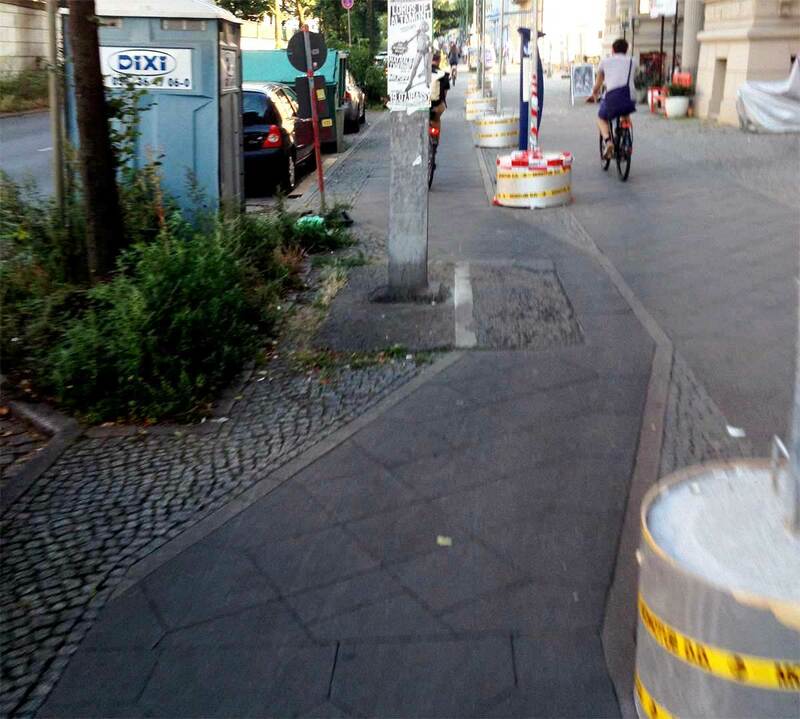 Anybody who says that Berlin is great for cycling doesn’t know what they’re talking about. I’ve heard it said that Berlin, with a 13% average modal share for cycling, provides a more realistic model that’s easier for British cities to achieve. The trouble is, to someone who lives in a country where cycling has been actively suppressed for decades, almost any amount of cycling looks impressive. Living in the UK, it’s easy to see the current motor-dominated transport mix as normal or natural, and therefore to think that countries with higher cycling rates have done something special, artificial and unnatural. But the truth is that road design in the UK effectively bans cycling as a mode of transport for the vast majority of the population. 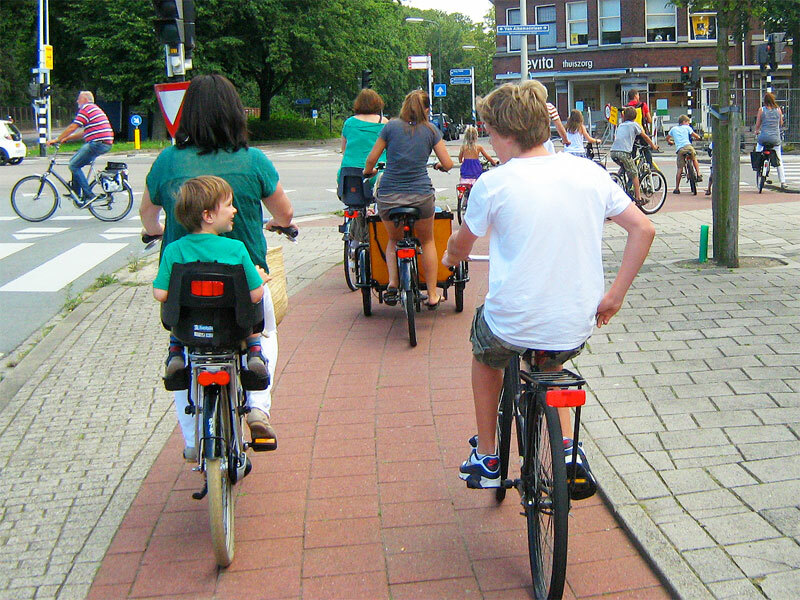 The “natural” level for cycling can be seen in the Netherlands, where car use is not discouraged (on the contrary), but there are no barriers to cycling either. The road system there has been designed so that people have a genuine choice. They can use whichever mode of transport they wish to, and they very often choose to use a bike. Somewhere in the middle we have places like Berlin, where the authorities pay lip service to cycling infrastructure, and grudgingly provide for a fairly low rate of cycling, but where journeys by motor vehicle are still prioritised pretty much all of the time, and given the lion’s share of road space. What this means is that Berlin’s modal share is low, much lower than it should be. A 13% cycling rate is not high or impressive, or anything to get excited about, though it may seem otherwise to people living in countries where cycling almost doesn’t exist. Berlin’s cycling share should be at least double the current rate, and with better infrastructure, it easily could be. 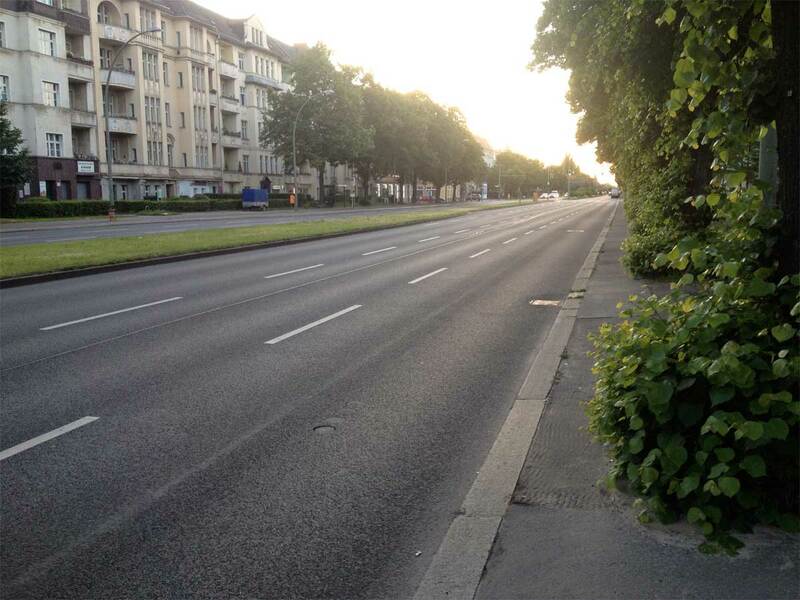 So Berlin does have some cycleways, separated from motor traffic. This is a good thing, and it enables many Berliners to use a bike for journeys which, without the cycleways, would be made by motor vehicle. But while these cycleways exist, and make cycling away from motor traffic possible, they are – almost without exception – awful. 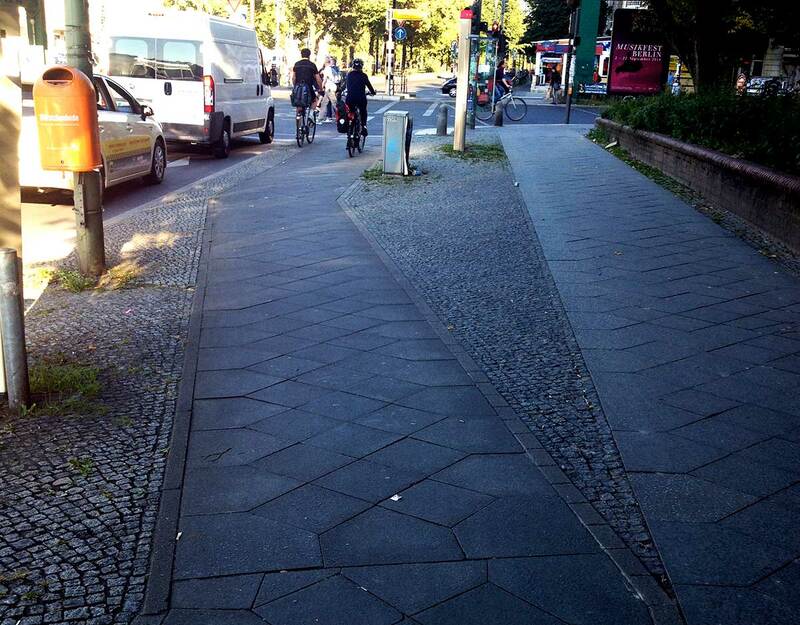 Berlin falls short on all three important aspects of good cycling infrastructure: maintenance, design, and network. …or rather the lack of it. For example, concrete tiles are normally used as the surface, and over the years these become uneven, meaning that riding on them is pretty bumpy, sometimes dangerously so. Tree roots lift up the surface too, though while the carriageway never seems to be affected (it is clearly better cared for), the cycleway and footway are often left rucked and cratered. Bushes and trees are frequently not trimmed either, meaning much (or, in places, all) of the cycleway width is taken up by foliage. Yes, that really is a cycleway on the right, and its patchy surface is almost completely obscured by a bush. And yes, that’s a wide, well-maintained six-lane road with central median strip on the left. Even the newest and best-maintained cycleways are poor in comparison to their Dutch counterparts. Even along the roomiest boulevards they’re too narrow, often wiggly, with street furniture right against (or even in) them. Flush kerbs are virtually unheard of, and the cycleways fall and rise at every driveway (most of which are surfaced in uneven cobble stones) and at side-streets too, where they usually turn into paint on the road. All this bumping up and down expends a lot of unnecessary energy and turns an easy journey into a tiring one. I used to play computer games like this as a child. The junctions are badly and dangerously designed, with none of the safety or convenience that you see in Dutch cities. That was the first one that struck me, incidentally. Where the Dutch take the cycleway away from motor vehicles at a junction, here in Berlin it bizarrely moves towards the main carriageway, suddenly thrusting you into the blind-spot of turning vehicles. This design also means that the Dutch-style protected, unsignalled right turns aren’t possible (where the cycleway, like the footway, isn’t controlled by the traffic lights as people turning right aren’t actually interacting with the junction). Rather than continue straight on, bike users are diverted into the blind spot of turning vehicles. 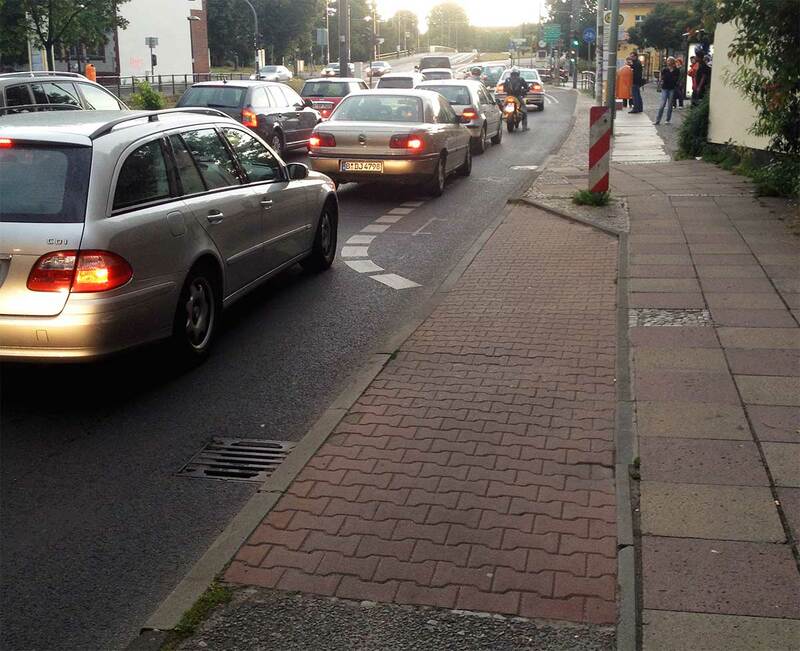 This is the standard for Berlin cycleways at junctions. The network is more of a patchwork, as it’s full of large holes and therefore unreliable. 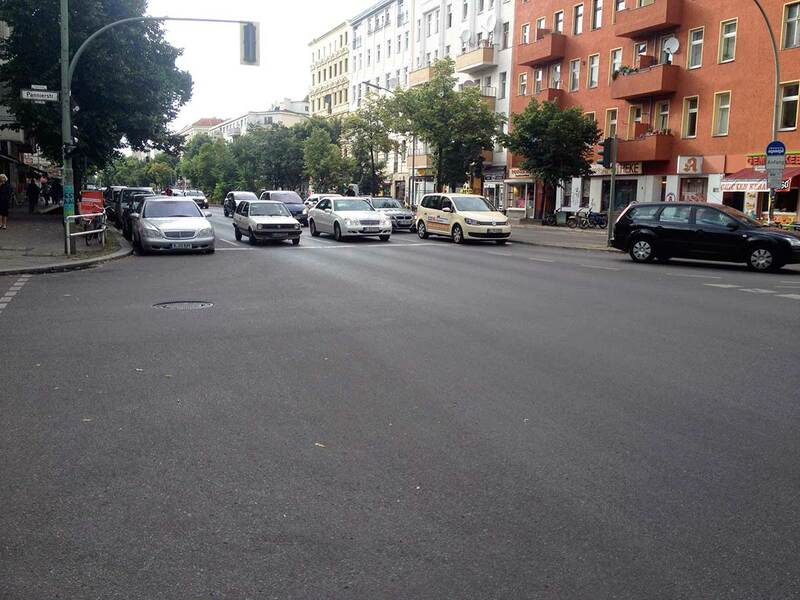 No space for cycling on Sonnenallee, but plenty of space for motoring. There’s no good alternative to this road either, so footway cycling is very common here. Some roads have cycleways, some have painted lanes, some have nothing at all. There seems to be no logic to it, either – some quiet, minor streets have cycleways for some reason, despite the level of motor traffic being very low, while many multi-lane urban motorways have nothing at all. There’s no consistency of provision, no minimum quality of service that can be relied upon. The surface can vary from smooth asphalt to a relief map of the Moon’s biggest craters. In places, the width of the cycleway suddenly changes at random and for no apparent reason, and in other places the cycleway suddenly disappears, unceremoniously dumping you into the carriageway. Should I get homesick for Britain, I’ll go stand here and remember why I left. When roadworks interrupt the cycleway, sometimes you’re thrust out onto a fast, busy road, but other times you’re sent the other way to mingle with people on foot, and sometimes you’re simply abandoned. I haven’t once seen a temporary cycleway take the place of a general traffic lane at roadworks, as is usual in the Netherlands. There’s unfortunately little joy in using the back streets, either. There’s almost a total absence of modal filtering, with most streets remaining two-way through-routes for all vehicles. 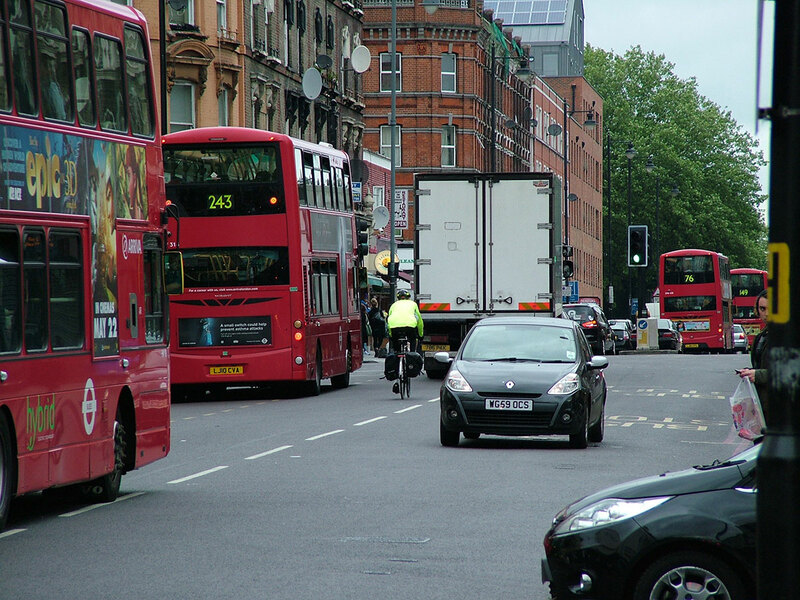 Luckily, the main roads are so good for driving that rat-running isn’t the huge problem it is in the UK – endless queues of traffic that are normal for London are unheard of here, even at rush-hour. But some people still choose to drive down the back streets at unsuitable speeds, and there’s very little to prevent this. Rough cobbled surface, busy two-way rat-run, pathetic attempts at traffic calming. What’s not to love? 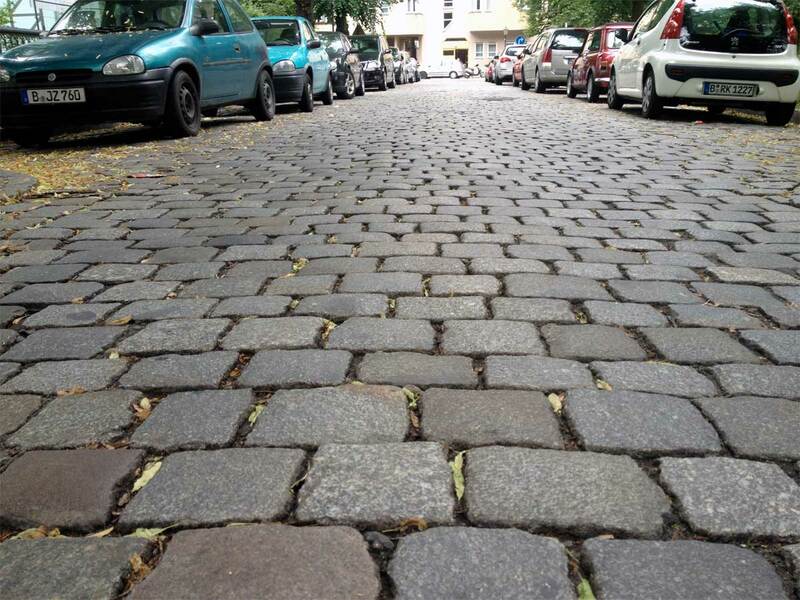 An even bigger problem with the back-streets is that they’re commonly surfaced in a kind of large cobblestone known as a “Pflasterstein” or “Kopfstein”. These are smooth with rounded tops, and are a real pain to cycle along at anything more than a crawling pace, and even then you’d better not be carrying any fruit. These surfaces are not always well-maintained either, meaning that large gaps can appear between uneven stones, creating danger for bikes. Despite their bike-inhibiting nature, thanks to modern car suspensions these cobblestones do nothing to slow down a speeding driver. Even when well-maintained, as seen here, this surface is awful to ride on. The photo doesn’t do it justice. Many people choose to ride on the footway along roads surfaced like this, even on streets with almost no motor traffic at all. All this means that while I have many more opportunities for utility cycling than I did in London, there are still huge swathes of the city that effectively remain inaccessible to me by bike, and many destinations within cycling distance that I instead choose to use public transport for, even though it’s slower than the bike and costs €2.20 each way. 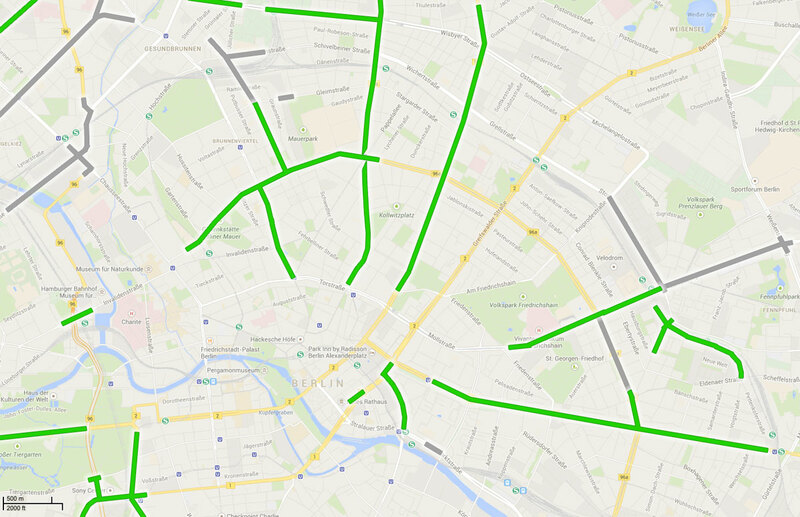 So Berlin is not a great place for cycling, though it may seem that way to visitors. It’s not all awful (I’ll show some good stuff at some point) and it is better than pretty much all English-speaking cities, and its lacklustre infrastructure does enable more people to use a bike. But really it’s a below-average place for cycling, with weak infrastructure – and that’s why Berlin shouldn’t be a model for elsewhere, except as a way of learning which mistakes to avoid. Footnote: If you’re looking at any of these photos and thinking “I’d like some of that”, please take a look at the videos of David Hembrow and Mark Wagenbuur to see how it should be done instead. Note: My German is okay but not perfect. If there’s anybody out there with native-level skills and a cycle campaigning urge, and you would like to proof-read/edit some German-language posts I have planned for a sister blog and campaign, please do get in touch! Note: I’m really struggling to comprehend the number of comments I’m getting along the lines of “ah, well I once had to carry three hundred melons up Mount Everest, so you are wrong”. So for the purpose of clarification: This article isn’t suggesting that every single journey made by everyone in the whole world should be made by bike. Of course buses, trains, cars and taxis all have their uses, I use them all myself. What I’m saying is that Britain’s infrastructure over-encourages the use of buses, trains, cars and taxis and massively suppresses the use of bikes, especially for short urban journeys (which make up the vast majority of journeys that people in the UK make every day, and for which the bike would make most sense for many people). Last week I went to an event 2.7 miles away from where I live. My journey was entirely urban, through London’s central financial district, AKA “the City”. I walked past where my bike is locked up, and kept on going. It took almost an hour. At that time of day, the bus would have taken nearly as long – probably 45 minutes or so. But I’d have been paying for the privilege of being squashed into a crowded space for the duration. Even if the tube had been running normally, it would have taken me 30 minutes at least, if the walking at either end was included. And again, I’d have been paying to cram into a tiny underground train with hundreds of other people. I call this Transport Poverty. I’m not the first to use this term, but I’m going to talk about what I understand it to mean. What are the options to British people today? 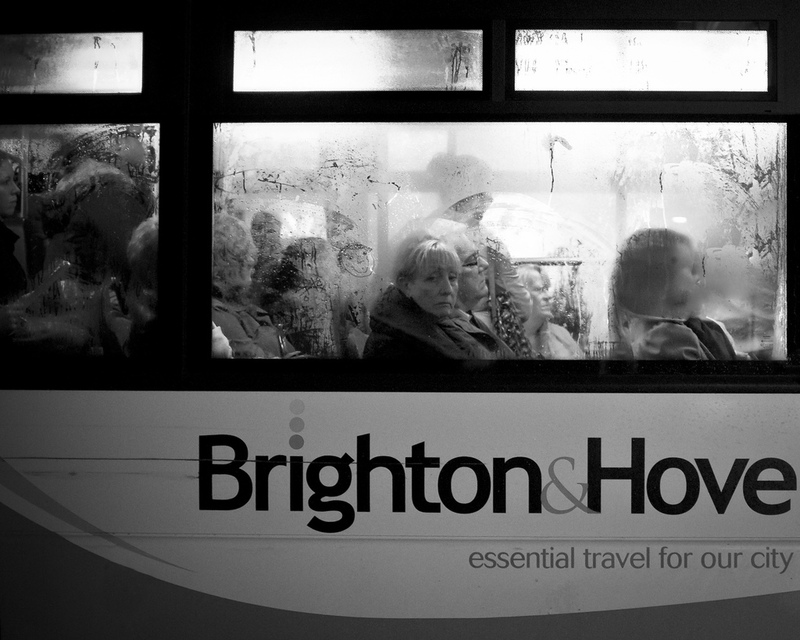 There’s public transport, which for most British people means a bus. Outside of London, buses are usually expensive (here in London it’s £1.45 for a bus journey of any length, in Leeds it’s usually £2 or £2.80 depending on distance – how does your town compare?). They can also be infrequent, especially in smaller towns or on Sundays, whereas here in the capital they are at least fairly cheap and pretty reliable. But we’re still paying £1.45 to sit on (or stand in, or squeeze onto) a great lumbering beast of a vehicle which almost certainly doesn’t even go exactly where we want it to, and even if it does then it may not take the most direct route. 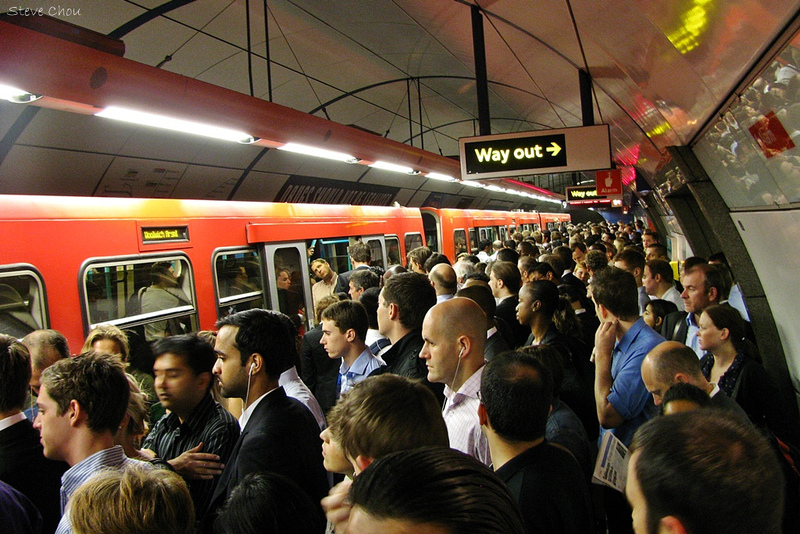 As Mark Treasure pointed out, a BBC News report about the tube strike showed crowds of people waiting to get on a bus whose entire route is only six miles long – and most bus passengers don’t travel from the first stop to the very last. Even if every passenger was going to the final stop, the whole journey would take only about 30 minutes by bike – and the bike takes you right to the very place you’re going, there’s no walking at the other end. The same goes for the tube and trains. Rail travel is great over long distances, but for a huge number of shorter journeys it’s terribly inefficient. Another down-side to public transport is that not only do you have to walk the first and last legs of your journey, but you have to wait for the bus/tram/train to arrive! You know, now I’m describing the actions required to make a short journey by public transport, the more insane it seems. You have a walk from where you are to the stop or station, then you have to wait for the bus/train/tram. When it does arrive it may be full to bursting, and it will stop several times at places you don’t want to go before it gets to your stop. Even then you still have to walk to your final destination. And that’s when everything is running perfectly – when there’s some unforeseen delay it can increase the total journey time massively, and surely we’ve all missed the last train or bus at least once? If you’re very rich then a good (almost-) door-to-door solution is a taxi, but these do cost a lot of money and are often no faster than a bus, as they have to sit in the same traffic as everyone else while you watch the meter run up your final price. It does also seem rather mad that in London we have a huge army of people driving thousands of empty cars around such a densely-packed city, looking for people who need an expensive lift somewhere. Then we come to the private automobile – usually a car. This option is very space-inefficient as just one person can take up so much room. Wherever these vehicles are found in great numbers in urban environments, you’ll find them going nowhere fast at all. The sheer bulk of the things means that they can never be a mass urban transportation solution, as our villages, towns and cities soon fill up with them, and the freedom these vehicles supposedly represent seems bitterly ironic. Given the massive cost of owning and maintaining these vehicles, many people have to spend a good chunk of their earnings on keeping one. I should also insert motorbikes into my list somewhere, but this is one option I don’t know much about. But while I’m sure they have their uses, and they don’t take up anywhere near as much space as a car, I’d say that they’re overkill for the vast majority of urban journeys (which are only a few miles in length). They make far more transport sense than cars in some ways, just for the space efficiency (and surely they’re more fuel-efficient, too?). I expect that, for most people, motorbikes also suffer from a poor safety image – which brings us to the humble bicycle. For my journey today (and for a vast proportion of journeys that British people make on a daily basis) a bike would have been easily the best mode of transport. It’s certainly much cheaper than the competition (except walking), and in central London – where the cars and vans barely move at all – it would have been much faster than any other transport, too. There’s no per-journey cost, it can take me from door to door, and it’s fast enough to make journeys across town quickly. It poses almost zero risk to other people, it doesn’t take up lots of space, and it doesn’t pump toxic fumes into the air. What’s not to love? Wow, it’s the perfect vehicle for urban journeys! What could go wrong? So what do millions of people do when they need to make a short journey of just a mile or two? They walk to a bus stop and wait. They flood into a tube station and wait. They sit in the traffic. Some of them even walk along the narrow footpaths and cross all those vehicle-priority minor side-streets! Very few of them even consider using a bicycle even though it would be the fastest way of making their journey, and cheaper than everything except walking, too. But given the dreadful conditions for cycling in this country, I understand that decision completely. So because using the easiest, most direct, cheapest and cleanest mode of transport involves high levels of stress and fear, the vast majority of people choose to pay to sit in queues of cars belching fumes, or herd into trains and buses. Cycling in Britain today really is that awful. And outside of my little central London bubble, the form of transport poverty that many are locked into is that of dependence on motor vehicles. In Leeds, where I’m from, people are locked in to car ownership, and most people feel they have no option but to drive. The buses are infrequent and expensive, and despite the acres of space available the conditions for walking and cycling are dire. I myself have felt the panic of having no car to rely on, back in what now seems like a former life. I have friends who still live there who really do feel the pain of car ownership yet feel there’s no alternative. Even for very short journeys, the car is seen as the only sensible option. Leeds could accommodate space for cycling, but it’s a matter of finding space in those narrow streets. In any Dutch city, even in the busiest parts of The Hague, Amsterdam or Rotterdam, most people would choose a bike to make such a journey. I’ve spent a fair amount of time in that country, and I’ve covered many hundreds of miles through countryside, villages, towns and cities, without any of the stress and fear which is the norm when riding a bike in the UK. If we didn’t live in a state of transport poverty, we wouldn’t even have to think twice about how to travel a mere 2.7 miles. This is the opposite of transport poverty. Transport affluence? Transport ease? Transport abundance? Whatever it’s called, I want it. Does the UK have the guts to do what’s required to create mass cycling? We’re good at talk, but action seems to be thin on the ground. The trouble with most British attempts to improve conditions for cycling is that they aim to cause little or no obstruction to private motor vehicles. As a result, we’re left with seriously compromised designs. Recently it has been reported that air pollution in Britain is responsible for many thousands of deaths, and most of that pollution comes from motor vehicles. Solving this problem will require more than just tinkering around the edges. Bollards and paint and signs, oh my! We should be thinking big. Little nudges will achieve little. Lambeth council has just voted to adopt a cycling policy which aims to massively increase cycling in the borough. What this will mean on the ground remains to be seen, as they already have a road user hierarchy which places walking and cycling at the top, followed by public transport, with private motor vehicles at the bottom. Yet there’s very little evidence of this policy on the ground. But that was published back in the dark ages of last year. Maybe they really do mean it this time! If Lambeth aims to be true to its word, then we’re not talking about a bollard here, a dropped kerb there, and a few “no entry except cyclists” signs. 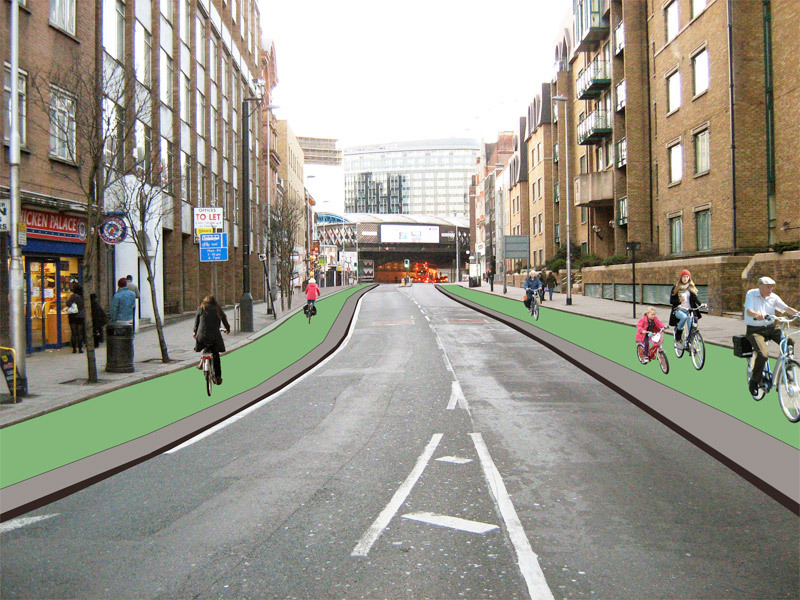 It will take far more than this to turn Lambeth into a great place to ride a bike. Why don’t we start here: close Westminster Bridge Road to private motor vehicles at peak hours. This is exactly the kind of project Lambeth should now be seriously considering if it is to become London’s top cycling borough. They’ve committed themselves on paper, now it’s time to follow through with concrete and asphalt. 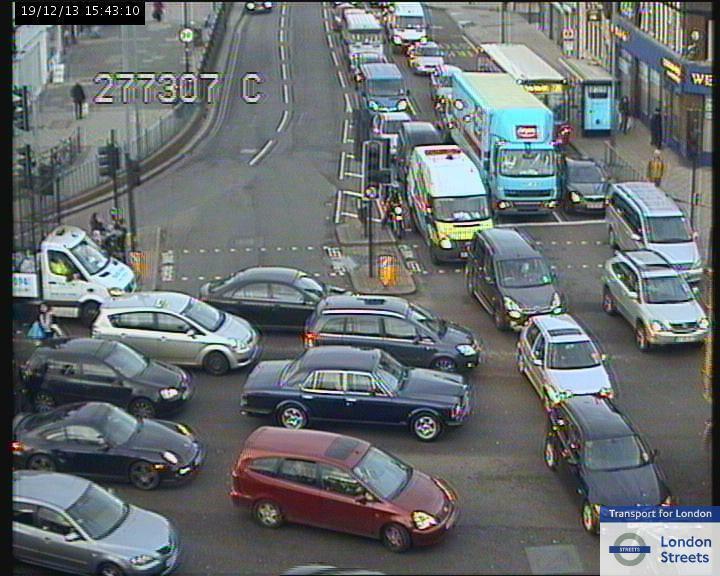 Why not restrict motor traffic on Westminster Bridge Road, between the railway bridge and Lambeth North tube station? 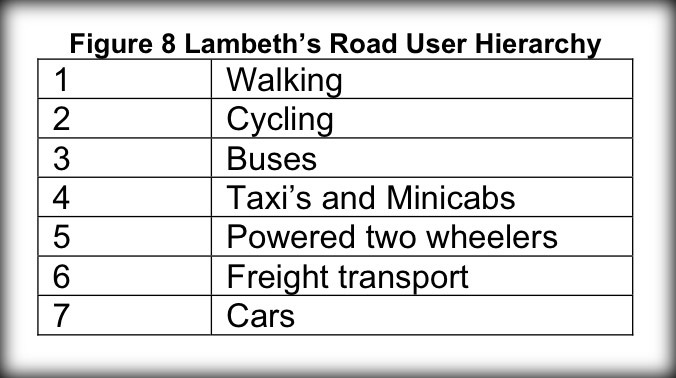 Private motor vehicles are at the bottom of Lambeth council’s road user hierarchy, so why are they allowed through here 24/7 creating an intimidating environment for cycling? This road isn’t essential, motor vehicles will be able to reach their destination by going around using other roads. Westminster Bridge Road is a busy bus route and therefore needs Dutch-style cycle paths along its entire length to be safe for cycling (there are far too many buses for ‘share the road’ to work). The section between the railway bridge and Lambeth North is narrow, so adding decent cycle paths into the current four-lane road would be a squeeze. As far as I can see there’s no other option but to remove the general traffic lanes. This isn’t just my opinion: I’m putting Lambeth’s very own policies into practice. It can be done, by the way. I know Haarlem isn’t London, but that Dutch city turned a pretty horrible road into a beautiful segregated-bus-and-bike-only road. Ding, dong, the Aldwych tunnel is dead! I’ve been trying to figure out Waterloo Bridge for some years now. How could it “Go Dutch”? The southern end, at the Imax roundabout, is easy as there’s tons of space. The bridge itself is fairly easy too, I reckon. Remove the central reservation, narrow the lanes and make it 20mph, and I bet there’d be space for cycle paths. But what about the northern end, where it meets Aldwych and the Strand? On the northbound side there are bus stops and footpaths which are too narrow already, and in the middle is the Strand Underpass motor vehicle tunnel. There’s just not enough space on the road. The nearside lane could be converted into a cycle path, and all private vehicles forced to take the tunnel at peak hours. But the real solution would be to remove the tunnel altogether. The portal takes up so much room which could be used to create a proper Dutch-style junction. I know this might sound like pie-in-the-sky madness, but it is possible. Aldwych is wide — incredibly so. The carriageway is five lanes wide. One is used for buses stopping, the next is used for moving vehicles. The middle lane, bizarrely, is used for parked taxis, the fourth lane is used for moving vehicles, and the fifth lane is for parking. This is utter madness, the land here must cost a fortune and we use it to store parked vehicles! So close the tunnel, make all traffic go around Aldwych — there’s plenty of space for that. Without the tunnel entrance and exit, there’d be space at the end of Waterloo Bridge and on Kingsway to install cycle paths. While we’re at it, and I say this with a heavy heart, we can lose the old northern portal to the Kingsway tram tunnel. The last tram passed through in 1952! Unfortunately it’s Grade II Listed, which means it’s likely to remain. I do like the old tram tunnel portal, I especially like that the tram tracks remain, but it’s taking up very valuable space on a busy road in central London. But if the tunnel can’t be removed, then a general traffic lane on each side needs to be taken. Whenever I go out in London, I’m amazed at the number of people travelling in cars, many of them with just a driver and no passengers. This still seems to be the main mode of transport for many people. London clearly isn’t doing enough to discourage private car use, and tinkering around the edges while maintaining motor vehicle capacity just isn’t going to change things. We should not continue to prioritise motor vehicles. Our political leaders keep talking about how great cycling is, it’s time for them to make it safe for people to do it. They keep telling us that cycling is a priority, it’s time for them to make it so. After 40 years, can Leeds finally stop being the “Motorway City of the Seventies”? Talking to people in Leeds about utility cycling is a bit like trying to explain air conditioning to Eskimos. I don’t mean to insult the citizens of Leeds here – I was one myself for 30 car-filled years. I love my friends and family, but they have lived their whole lives in a city which has one of the lowest cycling rates in a country with one of the lowest cycling rates in Europe, so you can hardly blame them for driving everywhere and thinking that’s normal and healthy. I understand that from this position the concept of utility cycling can seem baffling and outlandish. Nor do I criticise anybody in Leeds who uses a car every single time they leave the house. There are few genuine alternatives for most people. The bus system in Leeds is dominated by one bus company, almost to the point of monopoly, and there is no integrated ticketing system or smart-cards in use. So if you buy a day ticket on a FirstBus bus, you can’t use it on another operator’s bus. You can buy a “Metro Day” which is a ticket issued by the local transport authority, but that costs more and isn’t widely advertised. As there’s no Oyster equivalent either, each new passenger has to have a conversation with the driver about where they’re going, hand over cash and wait for change. Multiply this by several passengers, or even twenty or thirty people at a busy stop, and you’ll see why a bus journey in Leeds takes much longer than it should. There’s no metro system, just regular National Rail trains. These are only of use to those who live near a station, and who aren’t in a rush. They’re not the most frequent services either, to say the least, and some of them have certainly seen better days. The cycling modal share in Leeds is pathetic. Even the commuting share, which tends to be about twice as high as the overall modal share, is around 1%. In the student areas it rises to the giddy heights of 2%. But this is no surprise, as Leeds City Council has for decades promoted private car use above all else. Not long before I was born, Leeds proudly proclaimed itself to be “Motorway City of the Seventies“. That was actually used as a slogan for the city! You can imagine the sort of schemes they cooked up. However, there is a small ray of light shining through the diesel smog. Like many local authorities across the UK, Leeds, along with conjoined sibling Bradford, is at long last rousing from its 40-year transport slumber, awakened by the delicious aroma of central government money. Someone at the council clearly has a sense of humour, as they’ve called their bid Highway to Health. In it, they’ve used the word “segregated” which is interesting as this wasn’t even on the menu a couple of years ago, but it’s seemingly a word which no cycle plan can be without today. It promises “segregated, safe cycle lanes, secure cycle parking and activities to encourage cycling and walking” which sounds pretty good. And looking at the plans, they’re considering something which would give those 1970s planners heart attacks: “reduce existing carrigeway to provide cycle track”. This is actually really encouraging. There’s plenty of space in Leeds for really great cycle infrastructure (not that lack of space is ever a good reason to ignore cycling). They’ve defined two types of cycle track, one Dutch-style and one Danish-style, and they’ve got the general idea right. Pretty good, but not wide enough. 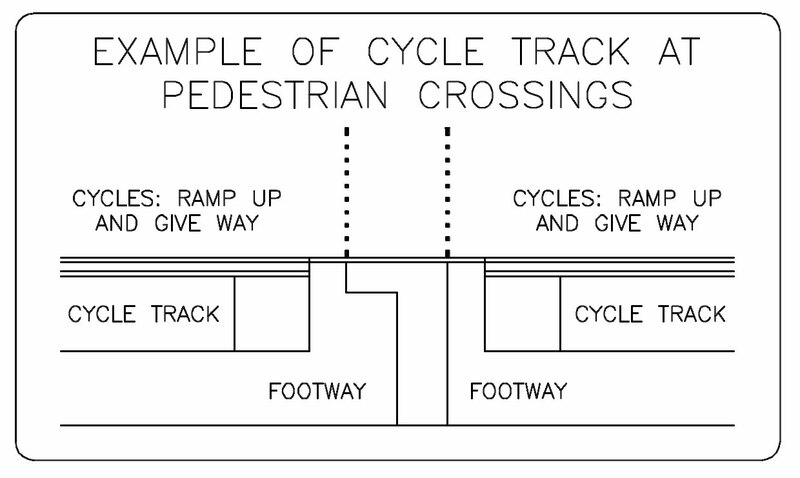 Ideally the elevation of the cycle track would always be halfway between the footpath and the road, as it is in the Type 2 diagram. They’ve also defined what their bus stop bypasses will look like, and they look pretty good to me. Looks okay to me. They’ve got the general idea. 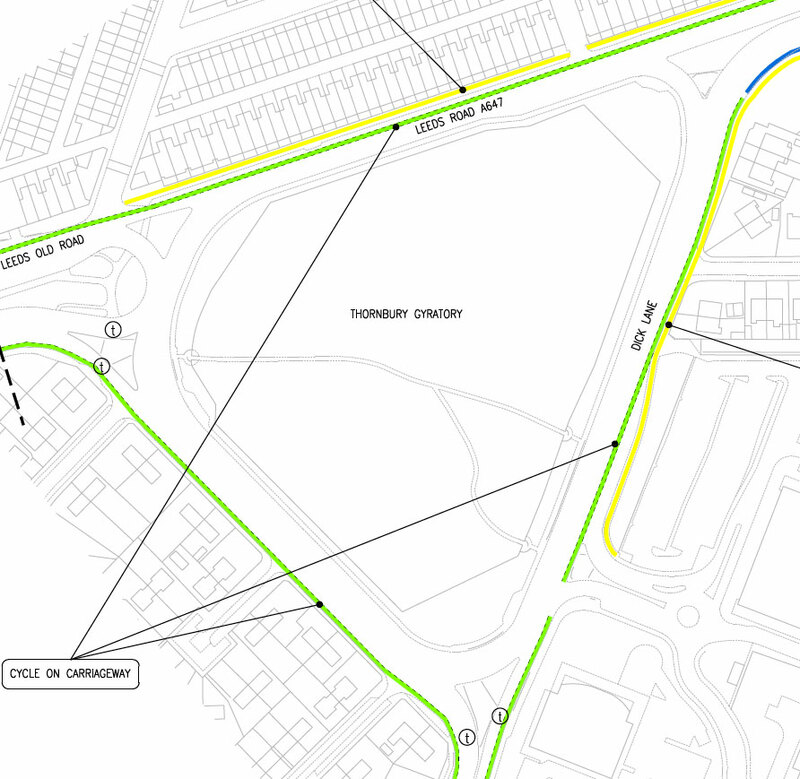 Part of the route has access roads alongside the main road, and these will be utilised for cycling as part of the plans. This is a great way to get a long stretch of decent cycle route, almost for free, as long as they can discourage as much motor traffic as possible by using alternating one-way restrictions and other methods. Unfortunately, while the general concept is a good one, they seem to have been designed by someone who drives everywhere, although they have watched that video of London’s planned cycle path along the Victoria Embankment. 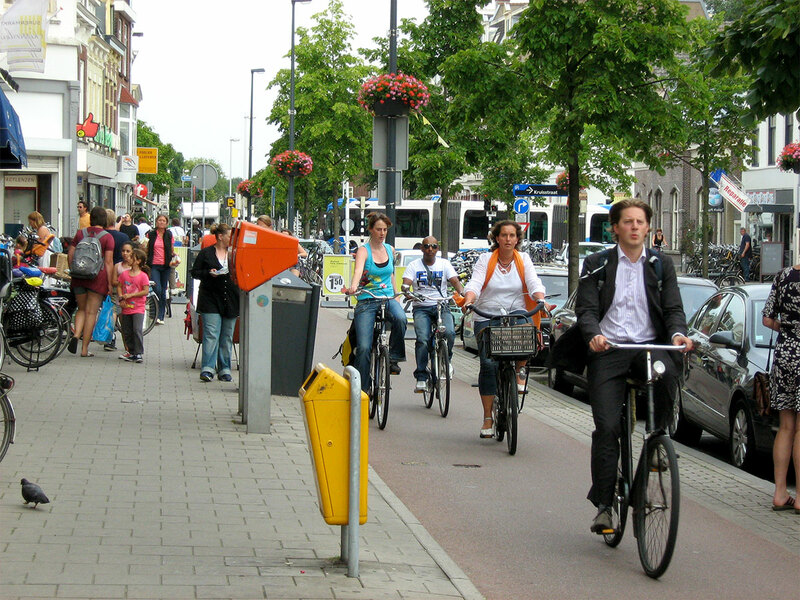 I doubt that those behind the plans have been to the Netherlands to see why cycling works so well over there. For a start – and it’s a biggie – their minimum width for a one-way track is only 1.5m, and 2.5m for a two-way track! This is far too narrow, and makes me worry that the whole scheme is about to unravel. 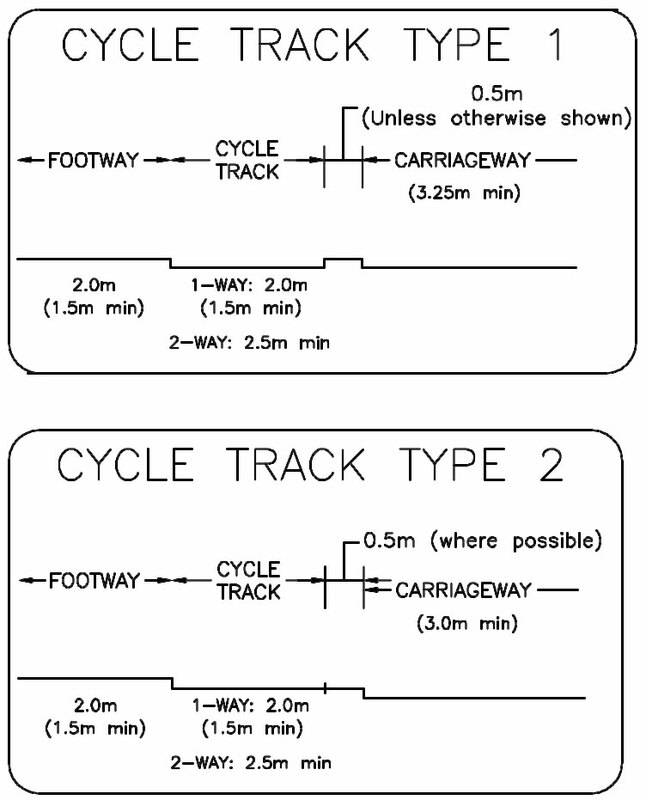 The standard minimum for one-way cycle track should be 2m (ideally 2.5m), and 4m for a two-way track. If the current widths are kept, Leeds’ cycle tracks run the very real risk of being seen as toytown infrastructure, dangerously narrow, and a waste of money. It also looks like they’re planning for full-height vertical kerbs, which reduce the usable width of the cycle track by quite a margin. It sounds like a silly little detail, but it’s really not. Kerbs need to be suitable for safe cycling, and the standard UK road kerb isn’t good enough. Also worrying is the number of toucan crossings (combined cycling-and-walking crossings). They’re nearly always fiddly for bike users and confusing or unnerving for those walking. If we must sometimes put the two modes together, parallel cycling/walking crossings are legal, so why can’t we use those? I’m not sure about their concept for when a cycle track meets a pedestrian crossing either. What happens if people are waiting at the crossing? Do bike users have to wait until the crossing is clear, or are they expected to swerve onto the footpath? Are people on foot expected to press the button then take a few steps back? A recipe for confusion, not fair on people riding bikes or walking. 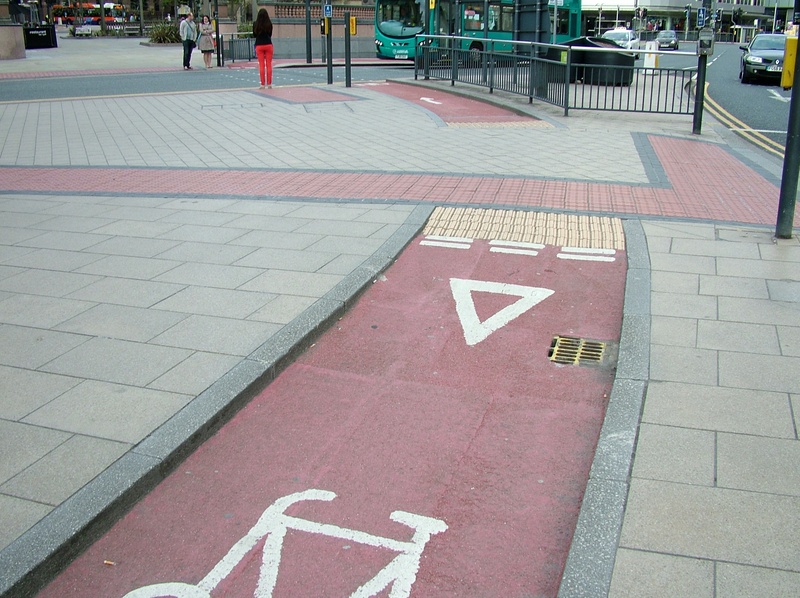 Well I say “in action” but this design only really works because so few people cycle in Leeds that the chances of a pedestrian meeting a person on a bike here are infinitesimally slim. They seem to be having terrible trouble getting junctions right. Whoever drew these plans really needs to visit the Netherlands, as all the situations have been solved already. 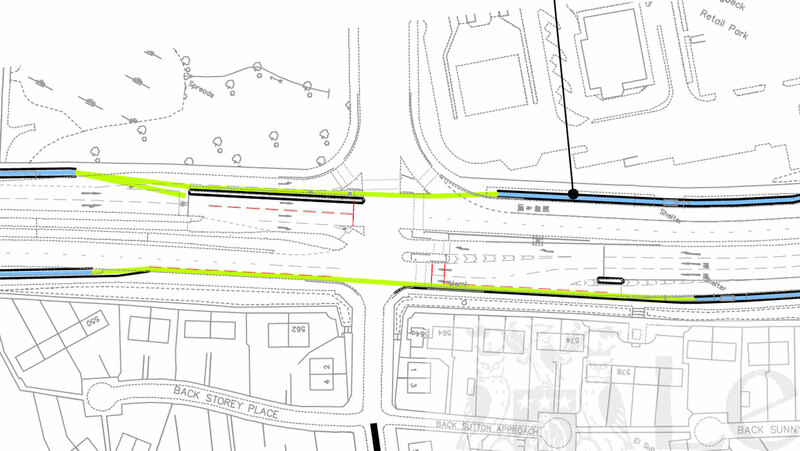 The current plans involve a mixture of ASLs, painted cycle lanes and toucan crossings, which simply isn’t good enough. Again, the Dutch have existing, working solutions for all of these junctions. Why not copy them? Do you think there might be a better solution here? Even though Dutch-style roundabouts are still undergoing trials, why not provide a single-stage straight-through crossing? Note to traffic engineers: IT IS VERY DIFFICULT TO DO A 90º-TURN ON A BIKE. 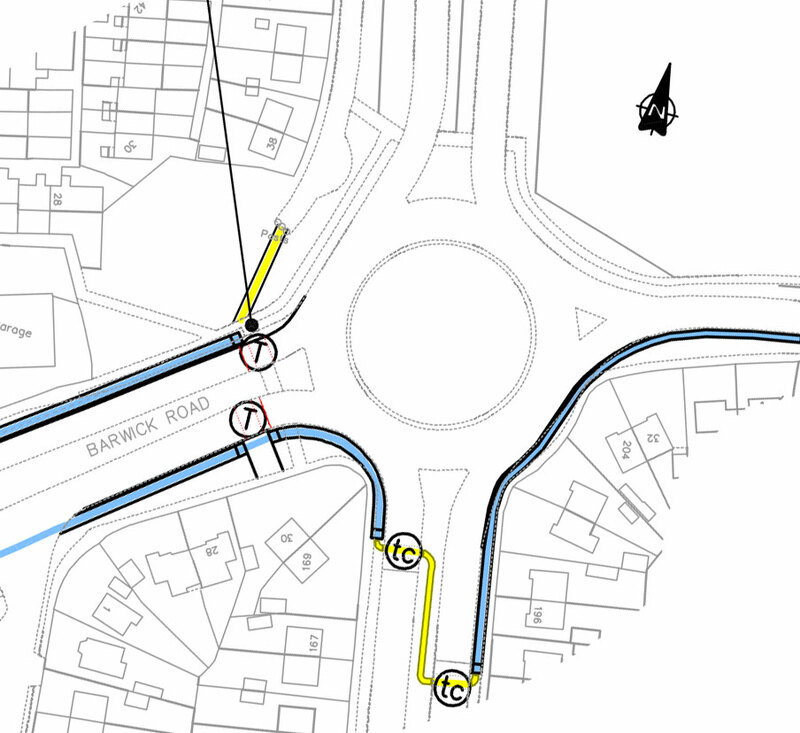 I know this junction well, and I can tell you that the proposed design is a mess. They really need to go back to the drawing board on this one. It’s really not that complicated (it was a roundabout until about ten years ago) but they’ll need to put in some cycle-specific signals to fix it. Dare they make the cars wait? This junction really isn’t that complicated, there’s no excuse for giving up on the cycle paths and putting in painted lanes instead. They may as well do nothing and cross their fingers. Junctions are where good cycle path design is needed most! 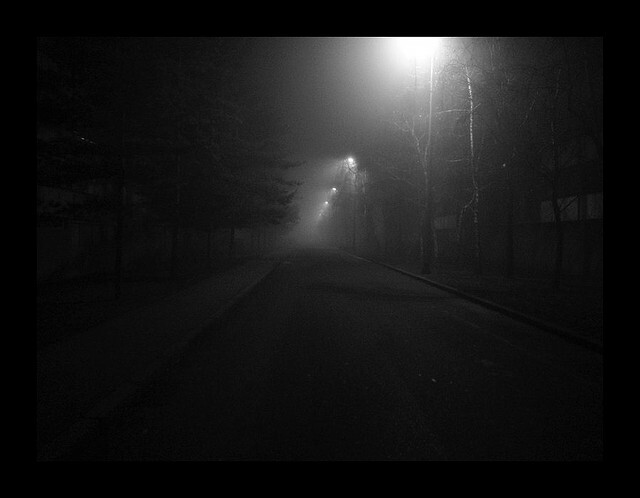 Oh Bradford, where art thou? I must reserve my ire for Bradford though, as they’re letting the whole thing down. 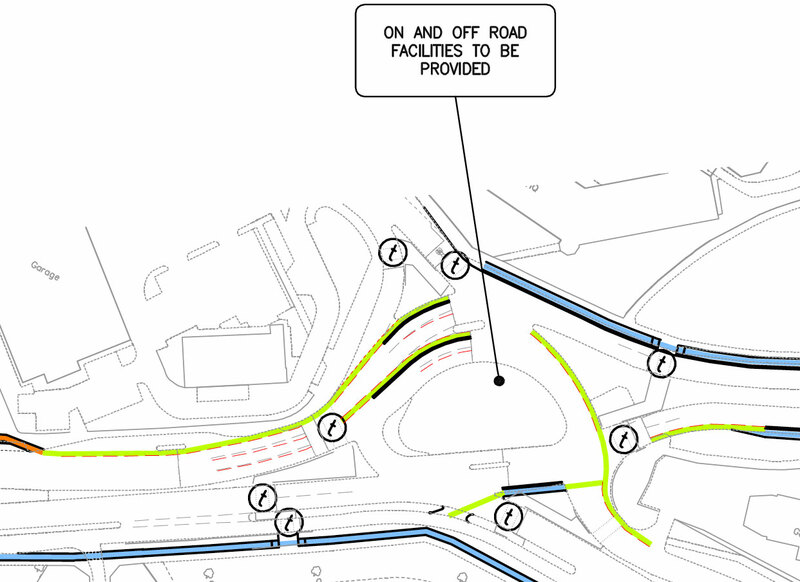 Their side of the scheme looks largely to be business as usual, with long stretches of “on-carriageway cycling”. If you’re lucky, there will be a painted cycle lane. The section below is on Leeds Old Road, which is a wide road with a painted central strip. There is plenty of space for a proper cycle track. Bradford aren’t even trying. 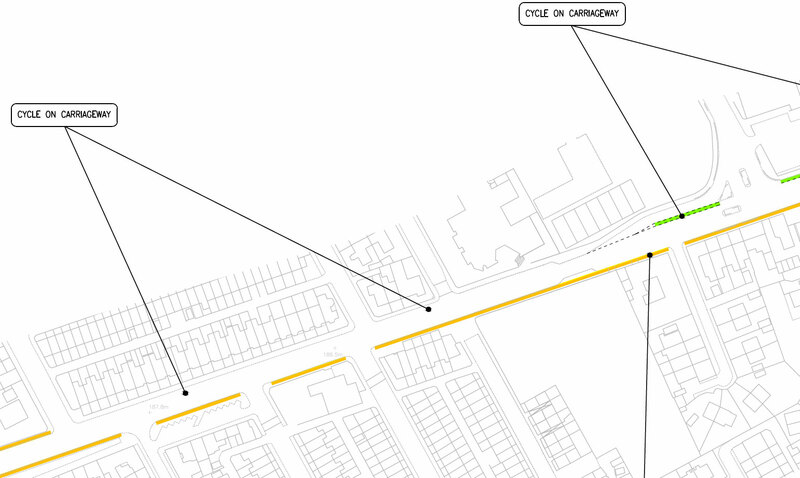 They’re even suggesting “cycle on carriageway” at the enormous multi-lane Thornbury Gyratory, which is ridiculous and shows that they really don’t care about cycling. This junction is HUGE, and all they’re suggesting is cycle lanes? Look at it on Google Maps. LOOK AT IT NOW. Maybe Bradford is secretly hoping to become the new Motorway City of the Seventies. 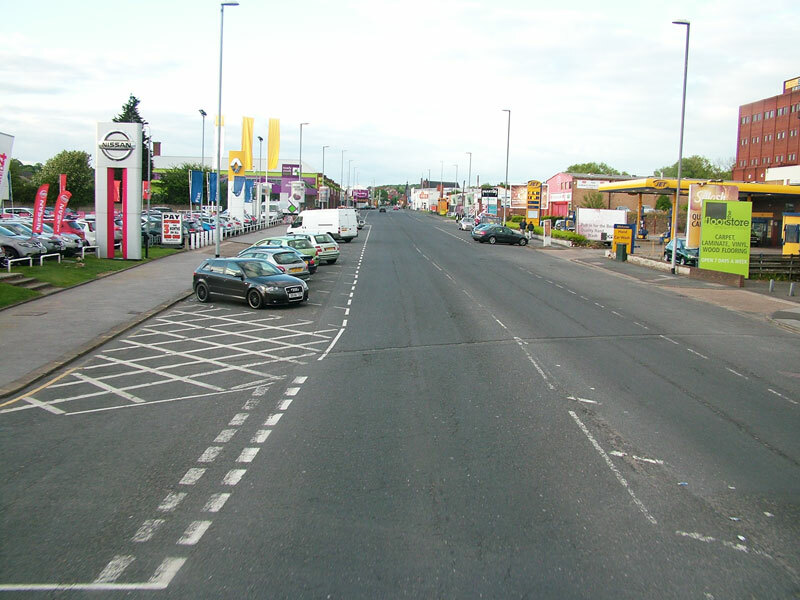 Overall though, the scheme is a huge leap forward, and a world away from the usual cycle provision of bus lanes, blue signs and apathy (well, the Leeds side is, anyway – Bradford really needs to get with the programme). It’s physically a huge scheme too, crossing right from one end of the city to the other. This is no complete solution, however. 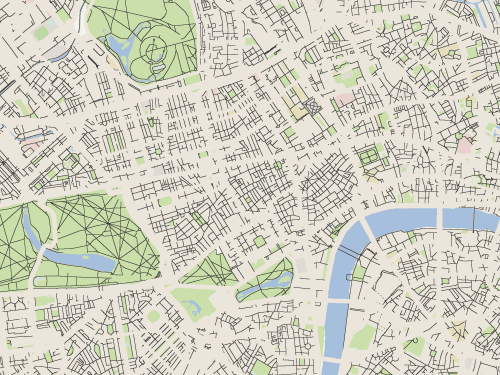 It’s still nowhere near the dense network of cycle paths and nearly-traffic-free streets which are required for mass cycling, and there are many details which need to be fixed. But there are very many good points also, and the general concept is the right one – provide safe, protected space for cycling, away from motor vehicles. With some alterations (fix the junctions, widen the tracks) then maybe – just maybe – Leeds can finally begin to leave the 1970s behind and one day become a 21st century European city. Manchester is also up to something which is good but could be better. Two schemes, in fact – this one in the city centre and this one on Oxford Road. You can take a look and tell the council how to do it right – even if you don’t live there you can respond. You know what? This Andrew Gilligan chap might not be half bad. I went to a talk last week at which he was the main event, and I went in full cynical miserable sod mode as usual, but I was pleasantly surprised. Having said that, I do like a lot of the language in the “Mayor’s Vision” document, which was written by Gilligan. There’s lots of bold statements about doing things right and about treating cycling as a proper mode of transport, all of which is very pleasing to the cycle campaigner’s eye. At the talk he told us that he accepts that installing cycle paths will sometimes increase journey times for motor vehicles – something which was heresy at TfL a couple of years ago, and probably remains so in certain quarters. He was also very blunt about some of the crap cycle infrastructure which has been installed in recent years (yes, he used the word “crap”), openly admitting that much of what’s been done, and what continues to be done, simply isn’t anywhere near good enough. But there’s also some rather less bold statements, about shared bus-and-bike lanes for example (Will motorbikes and taxis still be allowed in them? Is it fair that 50 bus passengers have to wait behind me as I ride at a casual 8mph? ), and a strange faith in the power of mandatory cycle lanes (“which motor vehicles cannot enter” – ha! ), but still, things seem to be pointing in the right general direction at least. I was rather disappointed by Gilligan’s target of 5% cycling modal share by 2020, which I consider to be rather unambitious, but at least he did explain his reasoning behind this, which is that it’s a larger increase than anywhere else has managed, so a higher target is very unlikely. (Though I wonder if he’s taken the awfulness of rush-hour public transport into consideration – surely Londoners would flock to a safe, free alternative to the Central line?). I may disagree with the figure, but at least he put some thought into it unlike Edinburgh city council which picked a number out of thin air before deciding not to bother. So even though I don’t agree with everything he says, I do like the way in which Gilligan comes across (though I suspect that’s one reason why he got the job in the first place). I think this might be because he’s a journalist and therefore skilled at communication, but also because he’s not a politician. He didn’t have to make any promises to a braying public in order to get the job, and he’s not chasing any votes in the future, so he doesn’t have to sugar coat bad news or slither his way around tricky questions. I found his honesty and candour to be quite refreshing, and I was impressed to see that he didn’t rush off immediately afterwards but instead stayed behind discussing things with attendees without even a hint of wanting to be somewhere else. So I want this post to be read in the spirit of constructive criticism, rather than just whinging. I’m also aware that I covered this topic in my last post, but I’m going to talk about cycle paths along main roads again anyway. At the talk on Monday there was much discussion of the Quietways and the obstacles which will need to be overcome. One big problem is that the local borough councils control most of the roads, and therefore TfL will need their co-operation (and the co-operation of residents) to implement the Quietways. When Gilligan was giving hypothetical of the new routes which will roughly follow tube lines, he said something like “for example, you could take the Bakerloo superhighway to Baker Street then get on the Circle Quietway to Kings Cross” as he waved his hand to the south, rather than out of the north-facing window towards the wide, thundering, TfL-controlled clearway of Marylebone Road which lay right outside the building we were in. I understand that was just an example and that he wasn’t giving us any hints about a probable route for this part of the network – he was very careful to not make any announcements like that yet – but I got out my map anyway and looked for a possible route from Baker Street to Kings Cross which didn’t involve riding along the terrifying but conveniently direct urban motorway which is the A501 (AKA Marylebone Road and Euston Road). 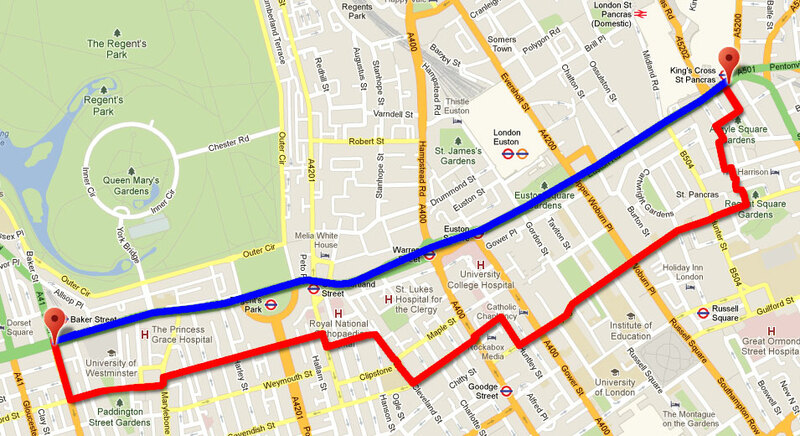 Dangerous but direct route (in blue), or safe but slow Quietway (in red)? The dual network awaits your selection! Sounds great, but that red line doesn’t look like an “integral part of the transport network” to me. The Vision’s promise of direct Quietways simply isn’t physically possible here. I strongly suspect that if the only option was a back-street Quietway, most of those hardened commuter cyclists who already cycle from Baker Street to Kings Cross will simply continue to do so along the A501. So who is the Quietway for? Surely we’re not talking about the ridiculous “dual network” again?! Why would TfL continue to prioritise motor traffic while keeping cycling hidden on the back streets? If Boris is telling the truth, then the only option is to take space from Marylebone Road/Euston Road and turn it into cycle path. Otherwise we’re just prioritising motor vehicles yet again (“Driving from A to B? Take the straight, direct road! Cycling from A to B? Turn right, then second left, then a dog-leg at the next lights, then left, then third right…”). The nice thing about this is that it would join up with the much-lauded Westway bike paths and – if you’ll permit me a moment of fantasy – from Kings Cross they could easily tackle Farringdon Road, Blackfriars Bridge and Road… Sort Park Lane out too, and we have a central London circular cycle route! This is a problem which the Quietways will come up against time and time again – very often, the only direct routes between popular locations are the big, busy roads. It’s a problem which will become particularly acute anywhere near the Thames, as nearly all the bridges are heavily used by motor traffic. Unless Gilligan has a big enough budget for two-dozen new bridges along the Thames then bikes will have to be accommodated on the existing bridges, and this can only be done by taking space from motor vehicles (or the footways – this isn’t an anti-car thing – on the western side of Blackfriars Bridge where the footway is extremely wide, for example). It’s not an insurmountable problem, but creating safe, clear space for cycling will require the cojones to take space away from motor vehicles, which I hope Andrew Gilligan has. But that’s not what the Quietways concept is. Don’t get me wrong – the Quietways are a hugely important addition to a proper segregated network of cycle paths, but on their own they’re not the cycling revolution we’ve been promised. They shouldn’t be the primary cycling routes. Maybe I’m being impatient here, but I worry that the Quietways is yet another attempt at providing cycling routes without adversely affecting motor traffic in any way, which are therefore ultimately doomed to die an obscure death on the back streets. And maybe I’m getting ahead of myself too – Gilligan didn’t give any details about the route, perhaps even the phrase “Circle Quietway from Baker Street to Kings Cross” was just a throw-away example. Perhaps they really are cooking up something exciting for the A501. I really hope so. I really don’t want to sound down on Gilligan, as I think he gets cycling in a way that nobody of influence at TfL has done before. But by going after this seemingly easy option of the wiggly back-street routes he runs the very real danger of repeating the mistakes of the LCN and LCN+, despite aims and promises to the contrary. Does Gilligan have the power and influence to change decades of motor-centric culture at TfL, or is he there to use his journalistic skills to put a positive spin on lacklustre efforts? Perhaps the real battle isn’t the one which Gilligan is prepared to enter with the boroughs, but the fight with a much bigger foe, which is long overdue. I speak of every liveable London and safer streets campaigner’s worst nemesis: TfL’s Network Assurance department.